One World invites you to bring your class to the beautiful One World Theatre! Please note, some of these shows are available to the public on our Calendar Page. 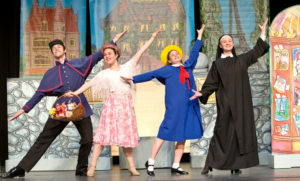 Through our field trips, children can visit the One World Theatre and see great performing acts that tour the country. At $6 a seat it is a treat not to be missed!! Pack a lunch, board a bus, come to One World and enter into a world of education AND fun! For questions about our field trip program, please email Tracy Remlinger or call 512.330.9500 ext 130. To buy tickets for a public performance contact the Box Office (512) 32.WORLD or OneWorldTheatre.org. Click here for the Field Trip Order Form. Click here for the Spring 2018-2019 Field Trip Overview. Specifically tailored to the educational school audience, this show is an excellent blend of eco-entertainment and eco-education. 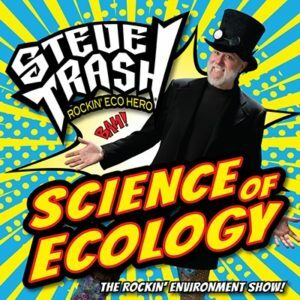 Featuring curriculum based study guides that relate directly to the content of the show, and awesome green themed magic tricks created by the Rockin’ Eco Hero himself – Steve Trash®. 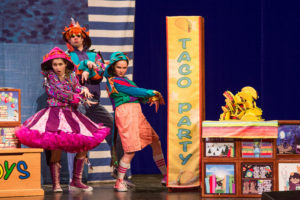 A TheatreworksUSA musical revue of beloved children’s books! Dragons Love Tacos by Adam Rubin, illustrated by Daniel Salmieri Dragons love all sorts of tacos — except spicy ones! When a boy throws his new dragon friends a spicy salsa taco party , red-hot trouble ensues. The Dot by Peter H. Reynolds A story about the creative spirit in all of us. Vashti can’t draw. Then her teacher says, “Just make a mark and see where it takes you.” Vashti discovers she is an artist, after all. Mercy Watson Goes for a Ride by Kate DiCamillo, Illustrated by Chris Van Dusen Mercy, a porcine wonder, and Mr. Watson go for a ride every Saturday in Mr. Watson’s automobile. But one Saturday, guess who winds up behind the wheel? Cowgirl Kate and Cocoa School Days by Erica Silverman, painted by Betsy Lewin Yee Haw! Cowgirl Kate and her loyal horse Cocoa are the perfect pair. They do everything together, until school is in session — and horses are not allowed! When the class gets lost on the way to the planetarium, Ms. Frizzle saves the day by blasting into outer space for an epic interplanetary field trip! But when rivalries both old and new threaten to tear the students apart, our young heroes must learn to pull together or risk getting forever lost in the solar system. 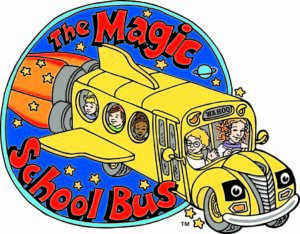 Hop on the Magic School Bus for a ride in this new musical adaptation by TheatreworksUSA based on the original book series published by Scholastic. 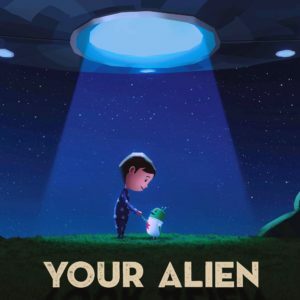 * Includes 1 free “Your Alien” book for your school!